ANURAG MALLICK and PRIYA GANAPATHY indulge in the royal pleasures of Deogarh, a tiny fiefdom in Rajasthan with a fairy-tale castle, rugged forts, village jaunts and ancient cave shrines. 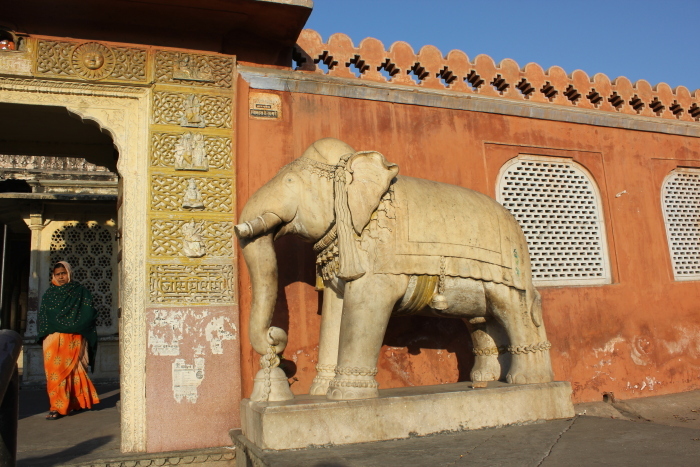 In another era, we would have ambled up the slope on an elephant’s back, swaying past bazaars before entering the regal gates of Deogarh Mahal. But given the century we found ourselves in, we resigned ourselves to the modest backseat of a taxi, secretly ruing that it wasn’t a vintage classic. The first thing that strikes you when you enter these precincts is its overwhelming grandness and antique appeal. 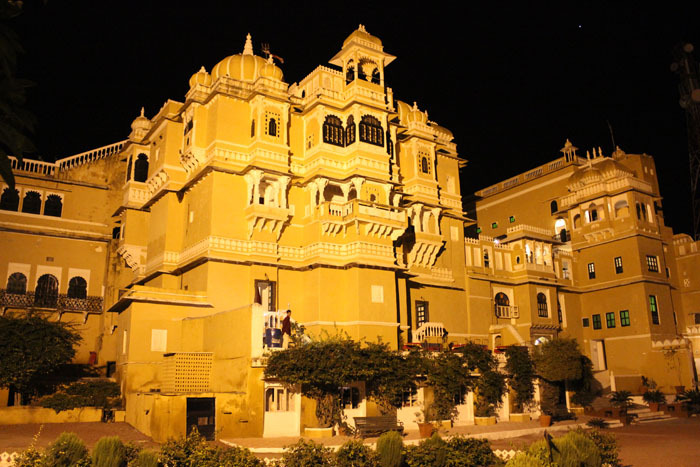 Tons of stone and lime had been procured to create this massive ochre and white palace that served as the residence of Rawat Sangaji, great grandson of the legendary Chunda Sisodia, one of the 16 Umraos (feudal lords) of Mewar. 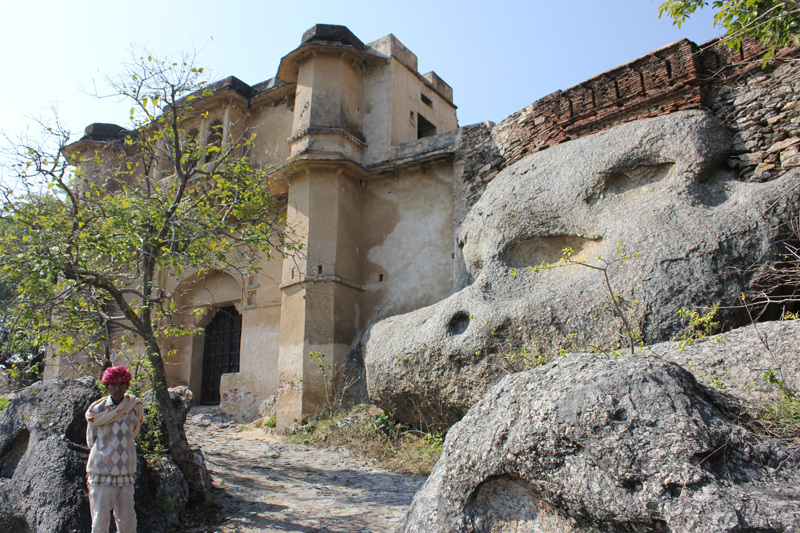 The history of Deogarh is inextricably linked to pride and honour. Story goes, when the powerful Rathors of Marwar consolidated their position by capturing the forts of Ajmer and Nagaur, they made Mandore their capital and decided to forge ties with the Sisodias of Mewar. Ranmal, fierce heir apparent to the Marwar throne came to Chittor with a wedding proposal. He hoped that the eligible heir to Mewar’s throne Chunda Sisodia, would agree to marry Rathor princess Hansabai. But destiny has its twists. Since Chunda Sisodia was away, his father, Rana Lakha joked that the proposal could not have been for an old man like himself. When Chundaji heard this, his bristling Rajput pride forbade him from accepting a bride ‘spurned’ by his father. To avert a revenge drama between the two clans, old Rana Lakha agreed to marry the young Hansabai, but on the condition that Chundaji abdicates the right to the throne. In true Bhisma style, Chunda Sisodia renounced his birthright, left Chittor and shaped a new dominion for himself in the lawless lands north. We sailed past the old katcheri (court) and stepped through an impressive entrance decorated with wall murals of horses into the inner courtyard. Niches, windows and doors were beautified by scalloped arches while walls studded with decorative mirrors twinkled in silvery collages of floral and peacock themes… We threw our bags and were off to explore the palace. Stairways led up to bastions, balconies and pumpkin-shaped turrets in the terrace offering alluring views of the Aravallis. 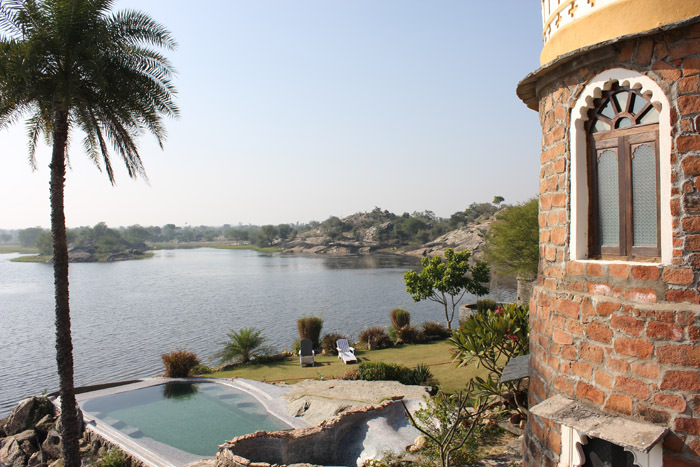 In an otherwise rugged corner of Rajasthan, Deogarh’s altitude (2100 ft) and location amidst lakes and forests made it comparatively cooler and a natural choice for a regal residence. A little gasp escaped our lips as we entered each room. 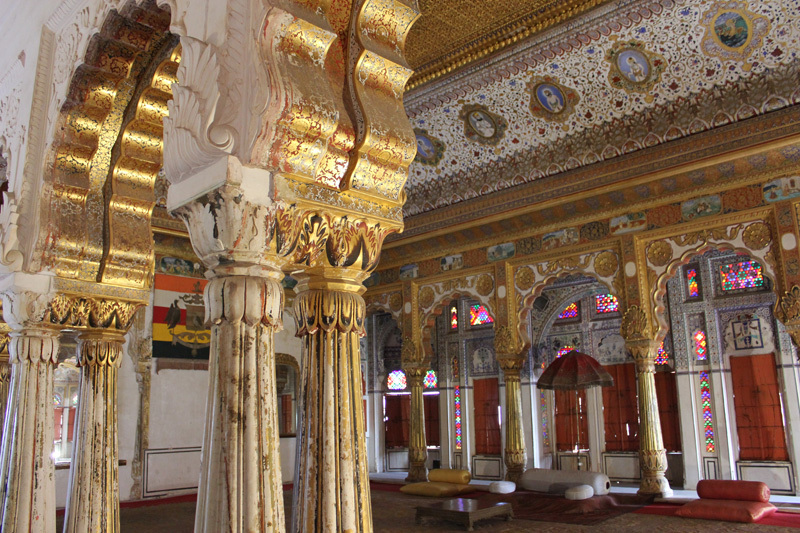 True to its name Sheesh Mahal was a royal chamber adorned with mirrors and stained glass windows. Sunlight streamed in to impart a sparkling jewel-like radiance to the room. Named Ranjit Prakash, the room was dedicated to Ranjit Singhji (1847-1867) who oversaw the renovation of this section. His regal portrait adorned the bedroom wall. The Maharana and Royal Suites opened in a profusion of low divans, cushions and carpets accentuated by stunning carved furniture, coloured glass and intricate mirror inlays with nature motifs and plush bathrooms; all of which added characteristic grandeur and enviable opulence. A maze of corridors led past rooms with themes from Lord Krishna’s life and the Mahabharata. A piazza displayed the royal marble throne while the Chitrashala or Artist’s wing showcased the distinct miniature painting style of Deogarh. A rear lattice screen looked like an uncanny prototype of the famous Hawa Mahal. Legend has it that Pratap Singh, younger son of Maharaja Madho Singh I of Jaipur and Princess Kundan Kunwar of Deogarh sought sanctuary here as a child, when his life was threatened by Jaipur’s scheming aristocracy. 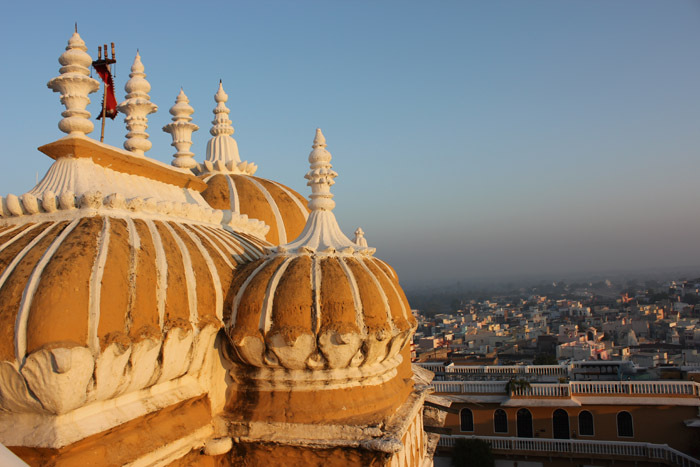 He built the Hawa Mahal in 1799 as a nostalgic reminder of his happy days in Deogarh. We learnt that the bathroom in Room 201 was once an open arched gallery for Bijay Singh ji (1900-1943), who loved to bathe thrice a day, pouring a hundred pitchers of water each time. It is said that when he went to attend his son Sangram Singh’s wedding in Bihar, the journey stretched to seven days because the train had to keep halting for his daily triple ablutions! Being the first Rawat who went to Europe, Bijay Singh was so enamoured by their trains that he installed railway-style sash windows and a matching washbasin in his bathroom! The Chundawats have inherited some eccentricities that continue to infuse Deogarh with quirky irreverence. We noticed the tongue-in-cheek “Duck or Grouse” warning on low doors and the crazy signboards that we passed earlier, “London Raining, New York Snowing, Deogarh Fine Weather, Only 3 km”. With a treasure of around 30 cars, we were taken around the garage and introduced to the sturdy army trucks named Thapero, Dhamero and Bhachero (a pun on Pajero). A fancy Austin had been renovated into Car-o-Bar (a bar on wheels). It wasn’t long before we were summoned for an open-air supper on the terrace with wine and an arresting spread of Rajasthani fare. The kebab and tikka starters kept on coming until we realized our folly – we had forgotten to give the signal! Only after we removed the little flag carried by a tiny elephant curio on the table and put it horizontally in its trunk did we graduate to the main course! The next day we set out on a rural ramble, preferring a jeep ride through the village instead of the horse carriage! We rolled past the busy bazaar and huts where women in colourful skirts and veils balanced columns of water pots on their heads with graceful ease, groups of old men in colourful turbans enjoyed their smoke and royal cenotaphs stood in quietude. We halted to watch a blindfolded ox merry-go-around a strange contraption; it was the traditional method of oil extraction from oilseeds. The blindfolds were to ensure the ox didn’t get dizzy! We headed towards Seengh Sagar, the erstwhile royal hunting lodge overlooking a lake, another family property 5km away. Gazing at an old map and the album that documented its renovation, we could only marvel at how the ruins of this lake fort had been transformed into a swish villa with a central courtyard entwined in creepers, a pool, open-air dining and three lavish bedrooms (named after musical ragas) with enticing bathrooms. Warm décor, silk furnishings, and attentive staff to take care of every need, Seengh Sagar blends luxury and solitude in the midst of nature. Another experience in the wilderness was the tented camp at Deogarh Khayyam. The woods are a haven for several species of birds and post-monsoon, the moats and lakes brim with water. We drove to the ancient cave shrine dedicated to Lord Shiva. A large step well signaled the 9th century temple tucked in the rocky hillside. We bent down to avoid the low ceiling studded with tiny bats to reach a wide inner chamber where a lone linga was decorated with flowers and statues of nandi nearby. Outside, it was dusk and the air was thick with the continuous twitter of birds flying to their nests. We clambered into the jeep once more to return to our palace for another night of royal pleasures. A buffet feast simmered on a long table as we supped to the tune of haunting folk songs on a moonlit night. After being royally pampered, we slipped under the quilted coverlet preparing ourselves for the heartbreak of returning to the humdrum of city life as commoners. Authors: Anurag Mallick & Priya Ganapathy. This article appeared on 1 September 2013 in the Sunday supplement of Deccan Herald. Susheela Raman and Sam Mills had just finished playing. The Qawwals were backstage. Somebody broke into a hum. Another clattered spoons on a plate. And then, magic happened… Impromptu jam ft. Mahboob Ahmad & Azad Pappo (Mian Meeri Qawwals Pakistan), Rajasthani musicians Nathoo Lal Solanki (spoon saucer) & Kutla Khan, Sam Mills (guitar), William Dalrymple & party (claps, whistles & whoops). Shot by Anurag Mallick. Between literary sessions at the Jaipur Lit Fest and all-night parties, ANURAG MALLICK finds the stamina to uncover some of the best-kept secrets of the walled city of Jaipur, on foot. Pandit Ramkripalu Sharma held the yellowed manuscript with the sure hands of a surgeon, yet at the same time, he held it with such tenderness as if a newborn child had just been handed to the proud father. 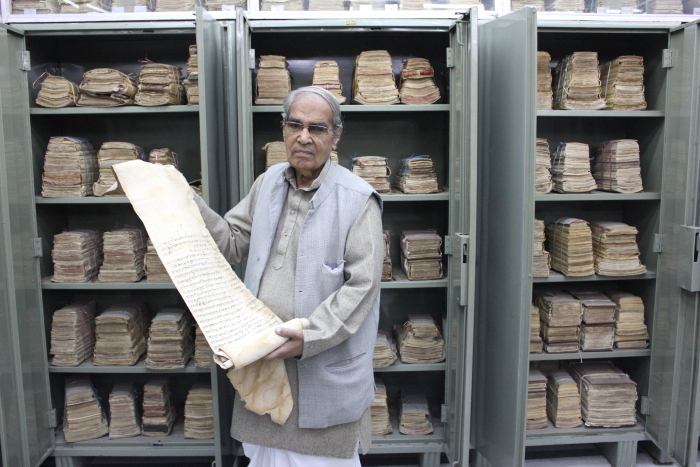 ‘I have over 1,25,000 such manuscripts in over a dozen languages,’ his voice quavered. ‘Some of them date back to the 14th century.’ To prove his point, Mr. Sharma’s son opened four Godrej almirahs to display endless stacks piled neatly. Above it, glass cabinets were already chock-a-block with more parchment. ‘Where’s the space to display everything? We’ve been planning to move to a bigger location, but let’s see,’ he sighed. Tucked away in a crowded back lane of Jaipur, this small three-storey tenement housed one man’s life-long obsession with antiquity. ‘Some call it madness,’ Mr. Sharma added softly with a smile. I looked at his private museum of unusual artefacts in awe – brass lamps, wooden dolls, metal statues, paintings displayed wall to wall, medieval games, shoes, textiles, every inch of space had been used judiciously. In one corner, locks of all sizes and types were on display; some shaped like scorpions and dogs! The scrolls covered everything from spirituality, science, art, architecture and yoga to medieval punishments for committing various crimes. It was fascinating and equally humbling to see the Sanjay Sharma Museum & Research Institute. And it was just the first of my discoveries on a heritage walk of Jaipur. Having ‘done’ Hawa Mahal, Jantar Mantar, City Palace and Jaipur’s forts, most visitors consider Rajasthan’s capital city as a mere gateway to the desert state. However, Jaipur’s charm lies not only in its monuments but also in what lies between them. Only a walk within the walled city was the real way to discover its true soul. And what better way to do it than through the eyes of a local resident. Akshat, my well-informed guide represented Virasat Experiences, a travel offshoot of Jaipur Virasat Foundation that specialized in heritage walks and cultural tours. The Modikhana Walk took us through the historic chowkri (ward) of temples and havelis, named after the Modis, a trading community. The Kalyanji temple displayed beautiful frescos of the incarnations of Lord Vishnu, the Sanghi Juta Ram Jain temple had stunning kundan wall decorations while the Sita Ramji and Tarkeshwar temples predated the city of Jaipur. We stopped at Fine Art Palace, a fourth generation antique store cluttered with bric-a-brac. The Afghan family was brought here by the kings to teach the art of tie and dye and the use of bow and arrow to his army. Besides a diagrammatic sketch of their family tree, their visitors’ book was worth a look as some entries dated back to the 18th century! In one lane, master craftsmen worked with brass, another alley was dedicated to lac bangle makers while an orchestra of ironsmiths hammered away in Thatheron ki galli. Jaipur’s streets, organized by professions and communities, owed their orderliness to the very foundation of the city in the 18th century. After a tantrik’s curse reduced the original capital of the Kachwaha Rajputs Bhangarh to a haunted site, they moved to Ramgarh and finally overran the Meenas to found a new citadel at Amber in 1592. By the end of the 17th century, a burgeoning population and scarcity of water led the rulers to seek a new, better-planned capital. 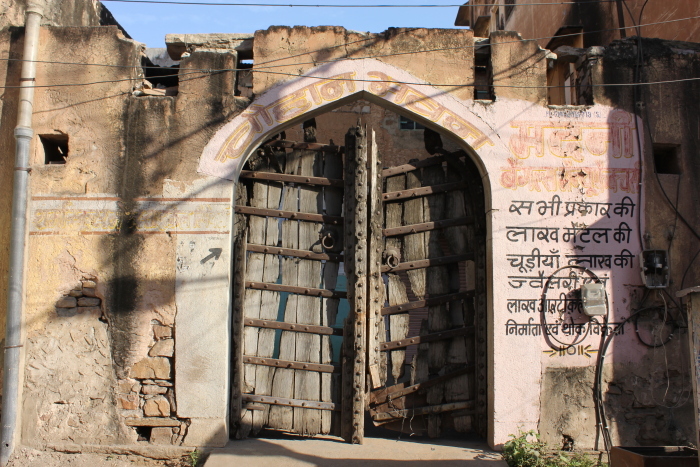 It is said that Sawai Jai Singh II’s gaze fell on the chosen site while praying at the Garh Ganesh temple. Consulting a Brahmin scholar from Bengal Vidyadhar Bhattacharya, Jai Singh laid the foundation of a new city in 1727 based on the ancient principles of Shilpa shastra (Vedic architecture). 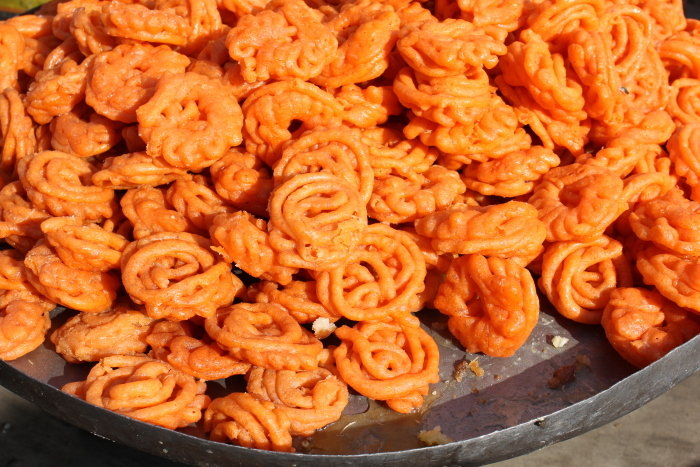 Built in the form of a Pitha Mandala, the city was divided into nine blocks with wide roads. Every street and market was aligned east to west and north to south. The Eastern gate was called Suraj Pol to mark the rising sun, while the Western gate was called Chand Pol, after the moon. Letters were sent to traders as far as Gujarat, Calcutta and Kabul, inviting them to settle in this new place. And that’s how the various communities and artisans set up shop in streets that still bear their name. 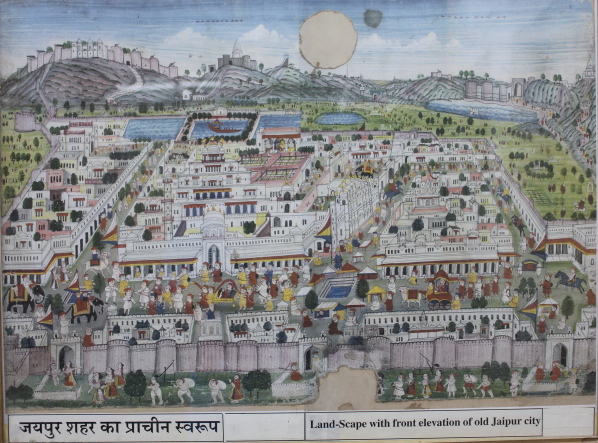 Nearly 2000 years after Pataliputra, Jaipur lays claim to being India’s first planned city. A good way to appreciate its architecture is the Temples & Havelis tour. Chhoti Chaupad (small square) near Chand Pol, one of the seven original gateways at the walled city’s western end, was the starting point of my second walk. 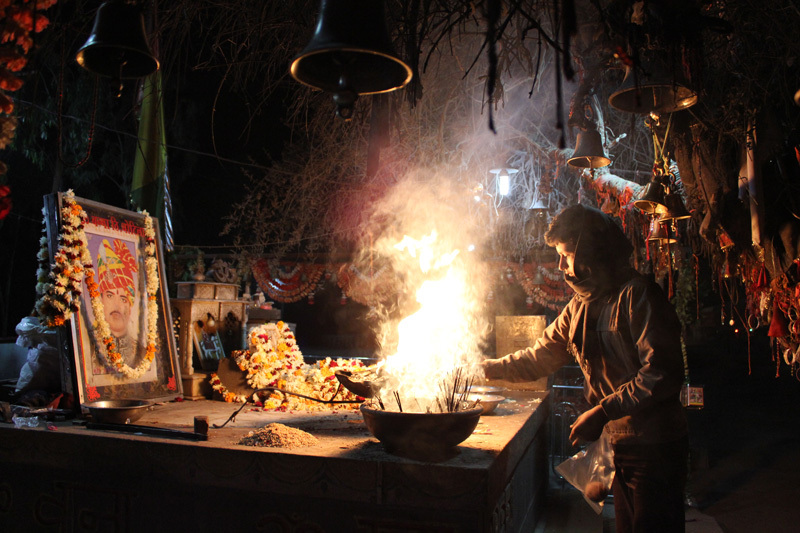 Traditionally a chaupad (crossroad) has temples on all sides – either regular shrines or haveli temples (dome-less shrines within the precincts of a haveli). As old as the city itself, the twin haveli temples of Sri Chaturbhuj and Roop Chaturbhuj were built by twin merchants. After the first brother, older by 2 minutes, built the first temple, the younger one built an almost identical one to its left within two years! Accessible by raised steps flanked by stone elephants, the temple had a profusion of paintings on the walls, ceilings and pillars. Even in the hot sun, the walls were amazingly smooth and cool to touch. ‘It’s a local technique arish where seven layers of limestone are put on the wall and the last wet layer is rubbed with coconut kernel,’ Akshat explained. Walking ahead, we reached Jharlaye walon ki mandir, an unusual 200-year-old Krishna temple with four pradakshinas (circumambulations) on four levels. The owners had been called from Benares to teach wrestling and the art of stick fight. Shri Gopal Sharma said that he still taught wrestling in the afternoon in an akhada behind the house. Taking us to the inner shrine, he pointed out ‘Lord Krishna… with 11 girlfriends!’ Er, do you know their names, I ventured. ‘Lalita, Vishakha, Chapla, Chitralekha, Rangva devi, Gaindva Devi…’ came the reply. We cut in from the road to reach Atal Bihari or Laal Hathi temple, named after two red sculpted pachyderms guarding the front. The 1839-built Kothari House seemed too florid for comfort, but I was told that elaborate paintings and designs were done on the exterior to indicate the prosperity of the occupants. 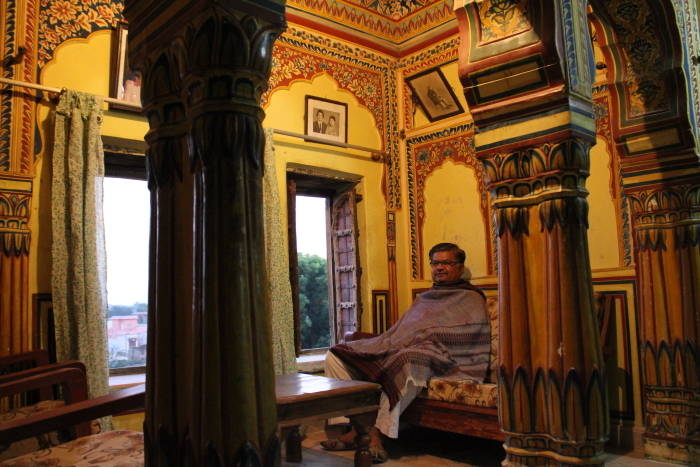 Madho Somani, part of a prominent jeweler family in Jaipur, welcomed us into Somani Haveli. By definition, any house with more than one courtyard was a haveli. This one had been neatly restored in the old style and rooms and doorframes bore painted floral borders. A creeper spiraled through the central courtyard as we climbed two floors to the terrace. We looked at the cityscape as the old forts of Nahargarh and Jaigarh looming behind us. ‘You see that?’, Akshat pointed out below. Before he could even say ‘Tantra Temple!’ I was down in a flash, knocking on what was a very strange door. Two eerie figures carved on the door in Indian garb stood as guards to Rudra Mahadev. One was wearing a strange peak cap. Beyond the courtyard, stood a tiny complex of 11 Shiva lingas. It represented the navagrahas (nine planets) and the sun and moon. After a quick stopover at Shri Gopinath Ji Krishna Temple and the Ramchandra Temple with beautiful frescos and a gold painting of the City Palace, we reached Bagru Ki Haveli for a well-earned breakfast of aloo, puri, kachori and sweets. 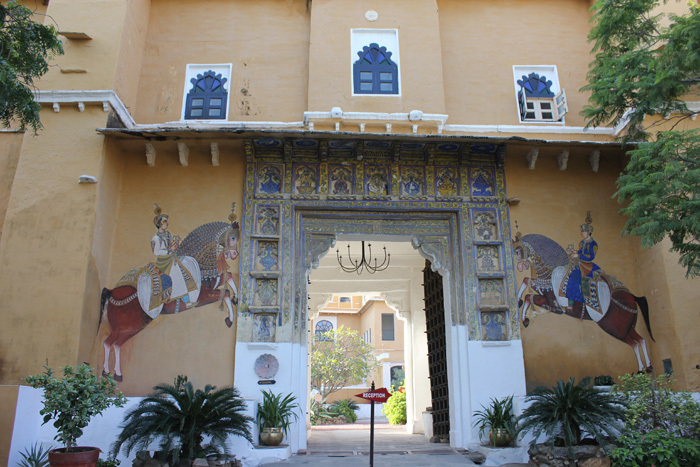 It was the royal home of a Rajput family from Bagru, a small village 30 km from Jaipur famous for block printing. 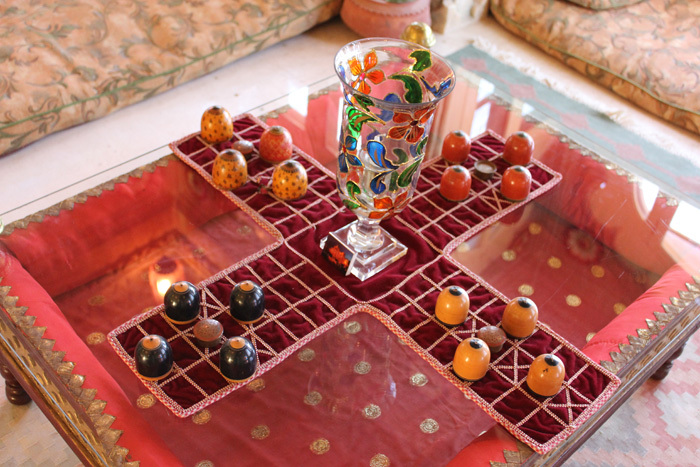 They organised workshops for visitors to see the process of printing on tablecloth and saris with wooden blocks. As I thanked Akshat for being such a wonderful and informative resource, he remarked, ‘But how can you go without doing the ultimate culture and culinary walk?’ I hemmed and hawed about the next day’s flight and my unavailability the following morning when Akshat put an end to the argument. ‘That’s perfect! The Bazaars, Cuisine & Crafts Tour is an evening walk. So I’ll see you at 5 today, Badi Choupar?’ The prospect of missing out on the best street food in Jaipur was too much to bear. A quick peep into Purohit ji ka katla (a market within a market) and we were soon walking past Swayambhu Hanuman Temple towards Hanuman Ka Rasta. The busy alley bustled with wedding card dealers, bookbinders, paper-sellers, printers and manufacturers of coloured envelopes for the local diamond trade. 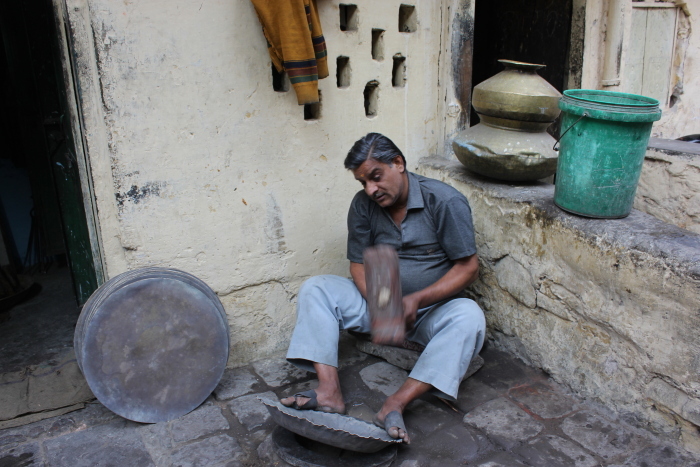 Gopalji ka rasta was an entire street dedicated to gem stone cutting and polishing. Legend has it that a few hundred years ago, the area of present-day Jaipur used to be a jungle. While on a hunt from Amer, Sawai Jai Singh II got separated from his party and found sanctuary in the Gopal ji temple, where he was given food and shelter for the night. The king promised that when he built his new city, he would reconstruct the temple and name a street after it. For centuries, Jaipur’s royalty and the elite had patronized the city’s talented craftsmen and artisans, who honed their skills over generations. Weaving our way past gold and silversmiths, we visited a fifth generation meenakari craftsman in his workshop. Honoured by a President’s award, he displayed his prize-winning creation – a rainbow coloured bird with an emerald bead hanging from its beak like a pendant. I don’t know whether it was the aromas of evening snacks wafting up from the street or the suggestive image of a bird carrying something in its beak that was the trigger, but we found ourselves magically wafting out of the building and onto Ghee Walon ka Rasta. We were about to trawl Jaipur’s legendary eateries, their identities closely guarded secrets, virtually unknown to outsiders. Batasa, misri and other forms of crystal and candied sugar were being sold wholesale. Slabs of fresh paneer were stacked on shards of ice like a game of laghori (seven stones). Namkeen Bhandars had shaped their colourful dalmoths, fried peanuts and yellow lentils in geometric designs in glass containers. We started with Dedh sau or Shop No.150. 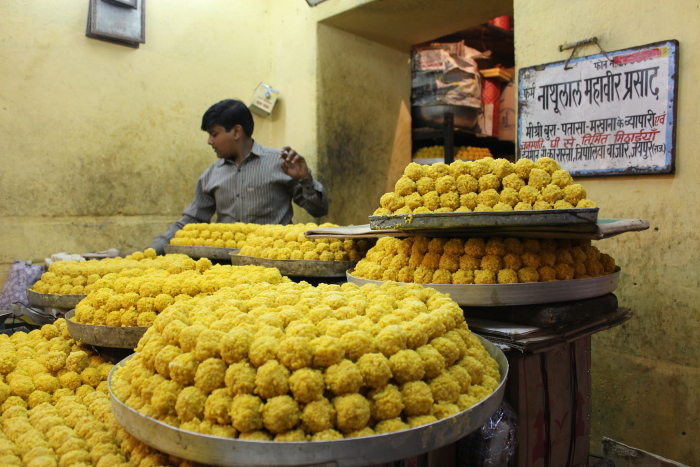 Karodiya Dukan specialized in Hing ki kachori (stuffed asafoetida savoury). Ramdev Restaurant run by Brijmohan served regular mithais like rajbhog and kesar bati to disco jamun and disco rasgulla. I saw more signs saying ‘Pure Desi Ghee’ than STD/ISD/PCO. We packed a meetha pan (for later) at the 80-year-old Kailash Pan Bhandar before stopping for makhaniya lassis at Johri Bazaar. The thick lassi had the consistency of an unguent! It tasted heavenly but I was so full, it felt like a tumbler of Brylcreem shoved down my throat. We somehow squeezed in some laddus at Nathulal Mahaveer Prashad and rabdi at Ramchandra Kulfi Bhandar. Early next morning, I reminded the air hostess twice before take off that I did not want to be disturbed for breakfast. She smiled with saccharine sweetness and asked whether I was unwell and wanted any medicine. I asked her for a pillow instead. Just then the phone rang, rudely interrupting the announcement to switch off all mobile phones. ‘Hello..’, I whispered. ‘Akshat here’, said the voice. ‘Just checking if you caught your flight. In case you missed it, come for the Amer walk. I’ll show you Panna Miah Kund, a step well built by one of Jai Singh’s eunuchs!’ ‘Forget walk, I don’t think I can even fly. Some other time! Along with the Mehrangarh walk,’ I mumbled. ‘Please Sir’, the airhostess said sternly. She had returned with the pillow and held it threateningly, ready to smother me into eternal silence. I put my phone and myself into Flight mode. Just when I was drifting into unconsciousness, a hand tapped my shoulder and a wide lipstick smile in Sugar Plum Shade 086 mouthed ‘Veg or Non-Veg Sir’. Author: Anurag Mallick. This article appeared in the April, 2012 issue of Rail Bandhu, the Indian Railways’ in-train magazine. No matter where you are in Jodhpur, you cannot escape the looming presence of the citadel of Mehrangarh, which dominates the city’s skyline. Perched at 400 ft on a rocky hill, the intricacy of its jharokhas (windows) and architectural grandeur moved Rudyard Kipling to call it ‘the work of angels and giants’. From Indique, the rooftop restaurant at Pal Haveli, a stunning 18th century heritage hotel, the red sandstone fort gleamed like a ruby in the early morning sun. By night, halogen lights transformed it into a bejeweled tiara resting upon Jodhpur’s proud forehead. But under all its glitter, Mehrangarh hides a grim tale of sacrifice. When Rao Jodha chose to move the Rathore citadel from nearby Mandore in 1459, he selected the hillock of Bhaurcheeria (Mountain of Birds), the dwelling of an ascetic called Mehran Baba or Cheeria Nathji. The moment the king’s men evicted the sage, the constructed walls collapsed. Though a temple was built at his dhuni (place of penance), the sage cursed that the place would be drought-ridden and to make the fort unassailable, a man had to be buried alive in its foundations! A humble skinner Rajaram Meghwal (or Rajiya Bhambi) volunteered on the condition that his family would be looked after till perpetuity by the king. True to his wish, even today, his descendants live in Raj Bagh and a stone tablet opposite Rao Jodha ji’s Phalsa (the original fort entrance) commemorates the incident. Every year on Jodhpur’s founding day (May 12), the Maharaja worships the skinner’s tools and felicitates Rajiya’s kin. A guided tour or an audio guide, available in 7 languages, is the best way to explore the marvelous fort, which spills onto many levels. 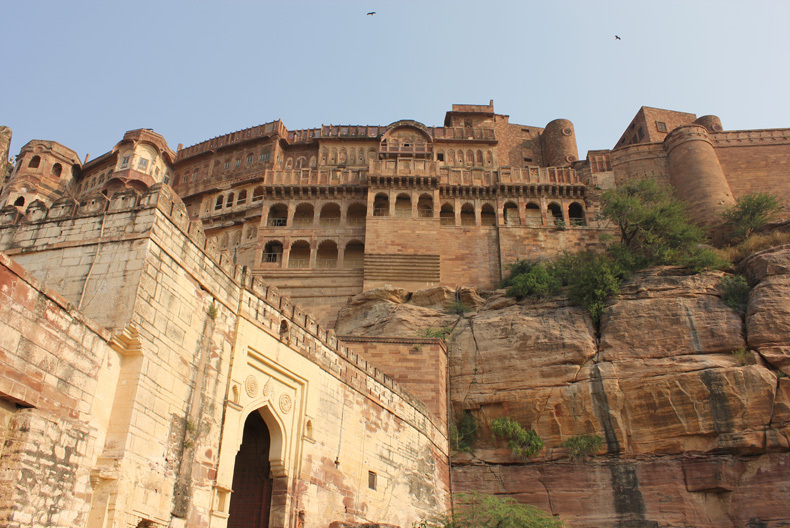 Legend has it that after a foreign dignitary grumbled about the effort required to see the fort, the Maharaja promptly installed an elevator, making Mehrangarh one of the rare forts in India with a lift! Tourists usually buy a 1-way ticket to reach the seventh floor and then amble down its wide cobbled pathways through a series of pols (gateways). Cheeky signs like ‘Lungs at Work, Please Don’t Smoke’ caution visitors while the gold filigree ceiling at Phool Mahal, the wall-to-wall paintings at Takhat Vilas and view of the famed Blue City behind the fort are sure to leave one breathless. Contrary to popular belief, the houses were painted blue not to ward off mosquitoes but given a fresh coat of paint every time a family member returned from a pilgrimage. Since most inhabitants of the old city were Vaishnavites, the colour represented their blue-skinned god. With well-displayed exhibits showcased by the Mehrangarh Museum Trust, a library of rare manuscripts, an art conservation centre, museum shop and café, it’s easy to understand why Time Magazine chose Mehrangarh as the Best Fortress in Asia in 2007. No trip would be complete without a royal dinner at Chokelao Bagh, a restored 200-year-old garden at the base of the fort. At night, the white chandni flowers and the sweet-smelling kamini infuse the Mehtab Bagh or Moonlight Garden in the lower terrace with heavenly perfumes while the restaurant on the upper terrace comes alive with folk performances. Nearby, the royal cenotaph at Jaswant Thada, built in memory of Maharaja Jaswant Singh II in 1899, is a beautiful structure in white marble where the kings were laid to rest. The distinct silhouette of Ajit Bhavan can also be seen in the distance. But there are other ways to experience the fort – take a zipline with Flying Fox or do a heritage Mehrangarh walk with Virasat Journeys, down Jodhpur’s historic galis (streets) dotted with temples and shops. 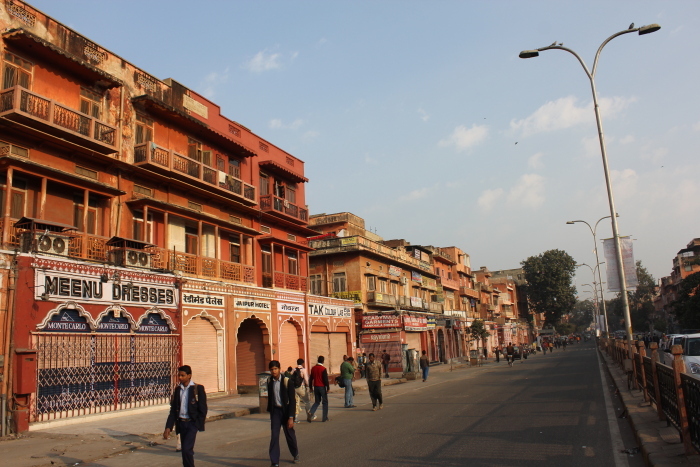 Within the precincts of the walled city in the shadow of the Clock Tower built by Maharaja Sardar Singh are antique stores and legendary shops selling sweets, itar (perfumes), grains and garments. 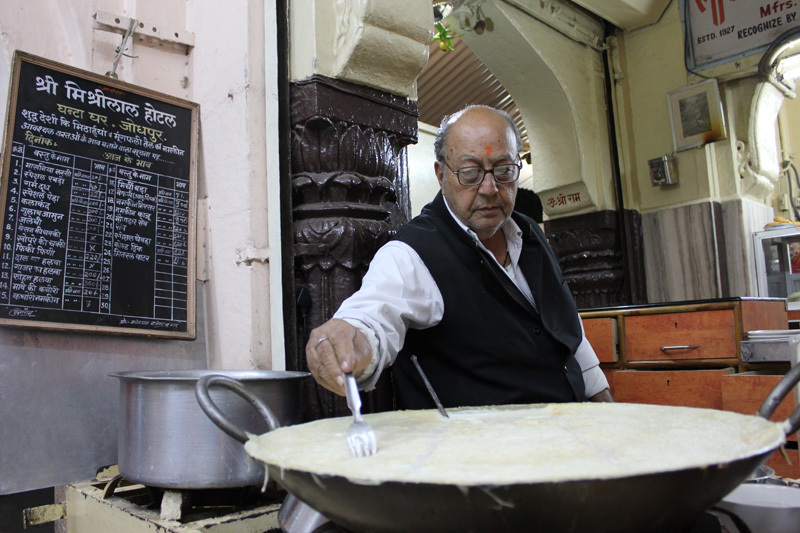 Mishrilal at Ghanta Ghar have been churning out their signature ‘Makhaniya lassi’, special rabdi and doodh-jalebi for over five generations. Under the Sardar Market arch is Vicky’s famous ‘Amalate (omelette) Shop – Recommended by Lonely Planet’! And when you’ve had your fill of Jodhpur, head to Mandore, the old battle-scarred capital of Marwar, which most visitors tend to overlook. 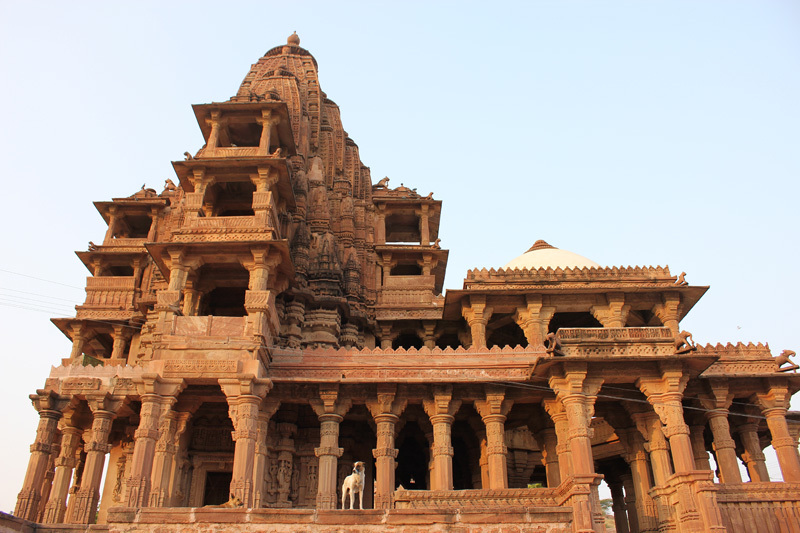 Popularly believed to be the birthplace of Ravana’s wife Mandodari, though no historical evidence supports the theory, Mandore was once the ancient Mandavyapura, an important centre of art and architecture. The old fort that caps the hill was acquired by the Gurjar Pratiharas, captured repeatedly by the sultans of Delhi and eventually received as a gift in marriage by the Rathore ruler Rao Chunda. Fine monuments like the cenotaphs dedicated to the members of the royal family, the Janana Mahal built as a summer palace for the royal ladies during the reign of Maharaja Ajit Singh ji (1707-1724) and the Government Museum are definitely worth a look. South of Jodhpur, just off the busy NH-65 lie the Bishnoi villages of Khejarli, Guda Bishnoiya and Rohet where centuries-old tradition still survives. After the customary opium ceremony, the local equivalent of smoking a peace pipe, our host, Jodha Ram Bishnoi elaborated on the Bishnois. In late 15th century Guru Jambhoji laid down 29 (bish-noi) conservation principles as per which all life forms were considered sacred. Bishnois revere the blackbuck and protect it with their life, as a leading Bollywood star found out. At Tal Chhapar, every Bishnoi family donates a kilo of bajra (pearl millet) each month to a community store. After wandering the plains all day, herds of blackbuck assemble around Bishnoi hamlets, to be lovingly fed at dusk. At Khejarli village a sacred grove of khejri trees is another living reminder of the inextricable link between Bishnois and nature. In 1730, a Bishnoi lady called Amrita Devi clung to a khejri tree, which was being cut to provide fuel for the lime kilns to build the Maharaja’s palace. Following her example, her two daughters, husband and 359 other villagers clung to the trees and gave up their lives. The very land of Rajasthan was soaked in the blood and toil of its proud, fearless people. After hearing fantastic tales and visiting strange temples (like the Deshnok Temple where locals worship rats as their reincarnated ancestors), we thought we had seen it all, until we discovered a shrine dedicated to the Bullet motorcycle! 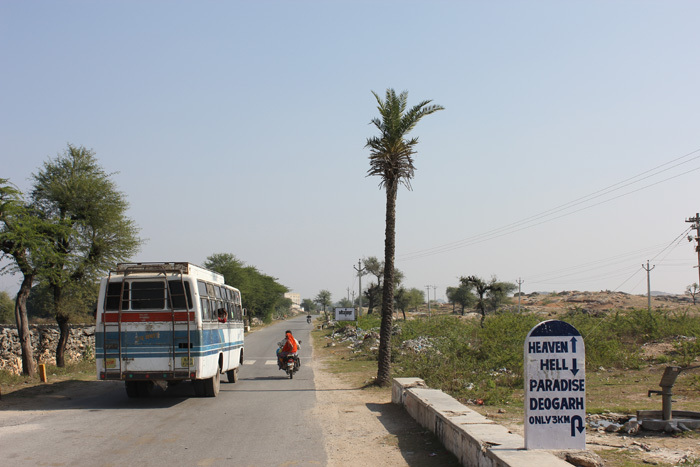 The roadside temple of Motorcycle Baba or Bullet Banna near Rohet is easy to miss. Dedicated to Om Singh Rathore of Chotilla village, who died here in a accident in 1988, the 350 cc Bullet is enshrined alongside Om Banna’s garlanded photo. Local folklore contends that after the cops impounded the bike, it disappeared from the police station and was found parked at the crash site the next morning. Each time the bike was seized, it magically returned to the accident-prone spot. Author: Anurag Mallick & Priya Ganapathy. This article appeared on 8 January, 2012 in Deccan Herald (Sunday edition).